I’m sure if you have ever been a GameMaster you sometimes suffer from the same nostalgic rememberance as i do. That particular dungeon, or that monster you created yourself or the first time you killed a playercharacter. I was going through my box with old, oooold papers from all my roleplaying years. It was quite fun to sit there and go through all my old maps and handwritten stories and notes. This was back before i even had a typewriter and no internet, at best i had a library and if i was lucky they had basic D&D and sword & sorcery solo books (go to page 23). I found what i seem to recall was my own very first dungeon, it was this hybrid of a labyrinth and dangerous rooms and it was HUGE! I thought i’d share the first page of this dungeon with you, just for the fun of it. I do believe i could find all the mapkeys and room descriptions, mostly it was just a note of what monster was lurking in room nr X. But we go the double door entrance at the top and a inevitable Throne room at the bottom with a secret door into the mountain. Part 2 of the dungeon is not as big, but it’s sizable. 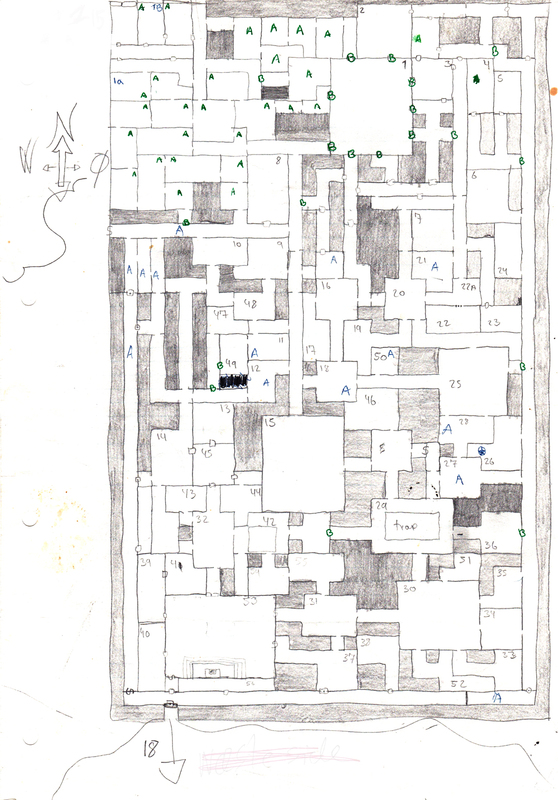 Knowing what i know now about players and exploring a dungeon, i would think more than twice about using this map. But i suppose it could be used for one of those times when you got a setup like that old dos game “Angban” i think it was called.. 99 levels of dungeon stuffed full of Morgoth and his monsters. I think i will continue to show you some of all that old stuff i found. Should i dig up the map legend and room descriptions for this dungeon?